Young Samuel Lord won a flash new mountain bike worth the best part of $400, now he’s promptly giving it away. Why? 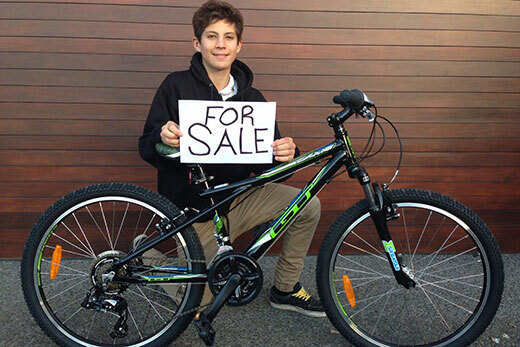 For sale – Samuel Lord is selling his prize bike to gift the proceeds to Elliot Keys. Well, Samuel spotted the distinctive red nut of Elliott Keys across a sea of mountain bikes at the Mount Maunganui teenager’s fundraiser in Tokoroa and he felt ‘gutted’. ‘Just like me’ means tall, lean and athletic with a head for adventure, a head for taking risks on mountain bike forest tracks. What’s different this year is Samuel has had a year of maturing – he’s back bigger and stronger. Elliott was robbed of that opportunity. “He went out and crashed and landed wrong,” says Samuel. Now Elliott is wheelchair-bound. So when Samuel won the spot prize, the 24in GT Aggressor, he was very excited with his win. But only briefly. He had two options. The prize bike’s too small for him so he could sell it and pocket the money. A 13-year-old could find lots to do with $300 or so. He chose option two. Samuel demonstrated a maturity and caring beyond his years by posting his prize bike on TradeMe with a starting price of $200. It’ll stay up for a week and hopefully sell. Then Samuel will give the money to Elliott to go towards his $40,000 Mojo all terrain wheelchair. That machine will get Elliott back in business, back in the driver’s seat doing what he loves most. Samuel’s mum Anita Lord is very proud of him. The Lords are now hoping some big-hearted person will appreciate the significance of the bike, not just it’s value, and pay a good price for it – a price befitting the generous spirit of a 13-year-old benefactor and his 15-year-old beneficiary. Meanwhile, Samuel admits he’s taking things easier on his Giant XTC – Sunday delivered him a salutary lesson about the dangers of his sport. And some statistics which stand testimony to the goodwill of Tokoroa. They predicted 80 to 100 mountain bikers would raise up to $2500. Introducing children to mountain biking is CRIMINAL. Mountain biking, besides being expensive and very environmentally destructive, is extremely dangerous. Recently a 12-year-old girl DIED during her very first mountain biking lesson! Serious accidents and even deaths are commonplace. Truth be told, mountain bikers want to introduce kids to mountain biking because (1) they want more people to help them lobby to open our precious natural areas to mountain biking and (2) children are too naive to understand and object to this activity. For 500+ examples of serious accidents and deaths caused by mountain biking, see http://mjvande.nfshost.com/mtb_dangerous.htm. Thumbs up to you Samuel your family have taught you well, all the best with your mountain biking.